According to the Behavioral View of consent, consent must be expressed in behavior in order to release someone from a duty. By contrast, the Mental View of consent is that normatively efficacious consent is entirely mental. In previous work, I defended a version of the Behavioral View, according to which normatively efficacious ‘consent always requires public behavior, and this behavior must take the form of communication in the case of high-stakes consent’. In this essay, I respond to two arguments by proponents of the Mental View. First, Larry Alexander, Heidi Hurd and Peter Westen have argued that my view has mistaken implications concerning the culpability of different actors. I counter that my version of the view does not have these implications, as it leaves us free to draw moral and legal distinctions between different offences involving non-consensual behavior. 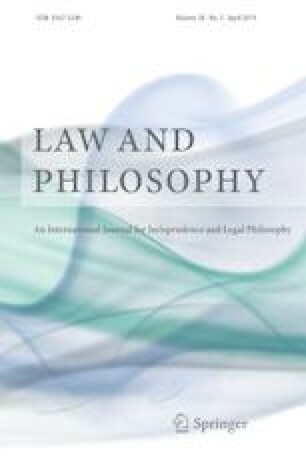 Second, Larry Alexander and Kimberly Ferzan have argued for an analogy between consent and abandonment: on the grounds that the normative power to abandon resides in one’s will, Alexander and Ferzan concludes consent does too. I counter that abandonment requires behavior, and call into question the assumption that the ethics of property have much to teach us about the ethics of sexual consent. For helpful comments, I am grateful to Alec Walen and two anonymous reviewers. The research for this essay was financially supported by an Early Career Leadership Fellows Award from the Arts and Humanities Research Council, Council Reference: AH/N009533/1.